Chinese tourists follow their guide in Seoul, South Korea. In perhaps the first olive branch from Beijing to Seoul since an ice-breaking agreement, a group of 3,000 tourists with China’s Youde Group will visit South Korea for their company’s year-end bonus. According to Yonhap News, this visit would be the first group that China has allowed to visit South Korea since they announced a ban on package tours back in March of this year. If this trip goes through, it could allow South Korea’s battered tourism industry, caught in the middle of a political row over the THAAD missile defense system deployed in South Korea, to breathe a sigh of relief. Tourist entries from China were actually up in January and February this year, increasing 8.3 percent and 8.1 percent respectively. But after Beijing announced a ban on package tours to South Korea in mid-March, tourist visits that month plummeted 40 percent, and the downward trend continued throughout the normally busy summer season. Total Chinese visits to South Korea as of September are down 50 percent over the same period in 2016, a decrease of more than 3 million visitors. And for the South Korean tourism industry, this drop has brought substantial losses. The Korea Tourism Organization has estimated that the average Chinese tourist spends $2,219 in Korea, translating into a potential $7.3 billion cost for tourism-reliant businesses like hotels and duty-free stores. In fact, duty-free stores have reported that revenue during the National Day period in early October, a major travel holiday in China, were down 10 to 15 percent. However, there is perhaps a silver lining to the South Korean tourism industry’s recent woes – despite that 50 percent drop in Chinese tourists, total tourist entries are down only 24 percent. 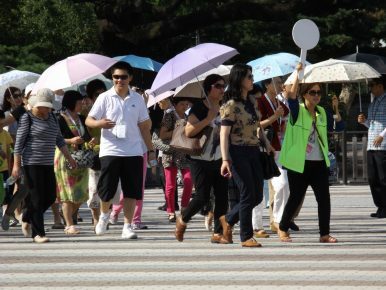 Even before the THAAD row, South Korean tourism officials had been emphasizing diversification to avoid an over-reliance on the Chinese market – even after the steep decrease this year, Chinese nationals still make up 32 percent of tourist entries to South Korea. Now, the tourism industry is particularly focused on creating more services for Muslim visitors from the Middle East and Southeast Asia, creating more halal restaurants and opening prayer rooms in major tourist locations like the Coex Mall in southern Seoul. Other hard-hit industries have similar plans to avoid future confrontations in China. Lotte, one of the most directly impacted companies in the row because it provided the land for the THAAD system, has more or less exited the Chinese market after China shuttered many of its Lotte Mart stores over “fire safety concerns.” Now, they are looking to open more stores in Vietnam and Indonesia. E-Mart, another chain, is selling off five of its six Chinese locations and instead shifting its focus to Southeast and Central Asia. Jenna Gibson is the Director of Communications at The Korea Economic Institute of America. She runs KEI’s media relations and outreach along with managing KEI’s online presence. Follow Jenna on Twitter at @jennargibson.